Just like my client, this project is small with big personality. He wanted fire, fire and more fire. Water was his secondary concern, but together they made a calming and intriguing space to enjoy. 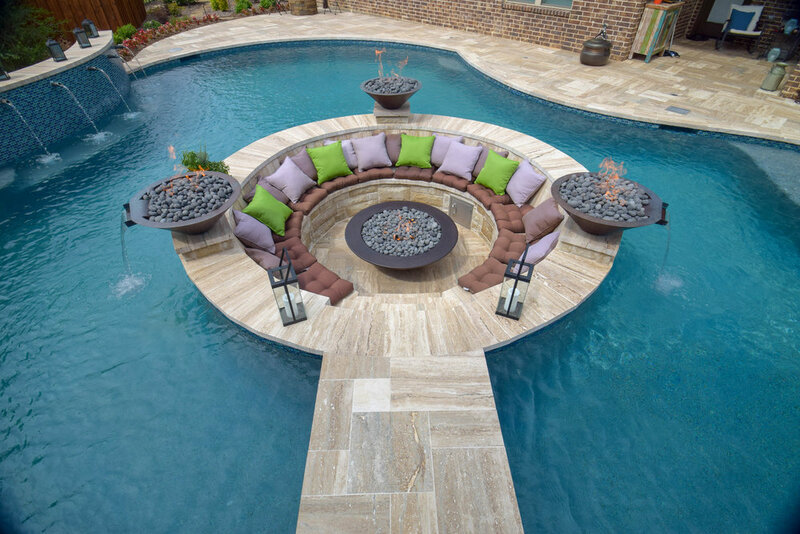 The number one feature he wanted to include was a walk-in firepit in the center of the pool. His desires also included incorporating a swimming/floating space, large tanning ledge, water feature and a cabana. I worked with the strict firepit setbacks along with the pool and cabana setbacks to fit all of his dreams into this small space. Aesthetically, he wanted something unique and clean. I accomplished this using the “S” curves to compliment the triangular shape of the yard. Materials chosen were important as well. He didn’t want anything too modern, so we added some warmth to the design with the Tiramisu travertine and rich 1x2 rectangular tile. The raised beam with spouts on the backside of the pool made for a nice backdrop to the fire bowls when sitting in the cabana. It can also be viewed well from the house. Underneath the spouts is a bench to sit and enjoy the falling water. The bridge from the cabana to the firepit created a couple challenges as the designer. I didn’t want to block any views from the cabana, so a traditional, arched bridge would not be considered. The client also wanted to swim all the way around the pool without stopping at the bridge. We were able to accomplish these two goals by spanning a flat walkway from the cabana area to the firepit allowing the water to flow underneath. It was a fun challenge to meet all my client’s requirements and create a pleasing design to add to my portfolio.